The conclusion to 2013-14 NHL regular season is fast approaching. After game play Monday, the League is down to 52 games remaining on the schedule, with 10 to be played Tuesday. Yet, much remains to be decided in the frantic run to the finish line, including playoff qualification, playoff positioning and numerous individual accomplishments and milestones. To celebrate the six-day countdown to the end of the season April 13 and the start of the Stanley Cup Playoffs on April 16, NHL.com will provide a piece of playoff-related content each day. The coaching profession offers no guarantees, unless you win the Stanley Cup. Do that and you're guaranteed a place in hockey history. Do that and your name will forever be etched on hockey's holy grail. Nine active coaches have won the Stanley Cup. Six of them are expected to be in this year's Stanley Cup Playoffs. Five are already in, and Detroit Red Wings coach Mike Babcock has his team close to clinching a wild-card spot in the Eastern Conference. Quenneville has the most wins among active coaches (705) and is third all-time behind Scotty Bowman and Al Arbour. More importantly, he is the only coach in the playoffs who has won the Stanley Cup twice (three times if you include his role as an assistant for the Colorado Avalanche in 1996). What Quenneville has done since taking over behind Chicago's bench four games into the 2008-09 season is nothing short of remarkable and could get him into the Hall of Fame. In fact, judging by his career accomplishments since he became a coach with the St. Louis Blues in 1996, Quenneville should be a shoo-in for a Hall call at some point. Only one time in his 16 seasons as a coach has his team missed the playoffs. He took the Blues to the playoffs in each of his first six seasons, winning the Presidents' Trophy in 1999-2000, before he was fired after 61 games in the 2003-04 season. Quenneville landed back in Colorado in 2005 and in three seasons got the Avalanche into the playoffs twice, losing in the Western Conference Semifinals both times. 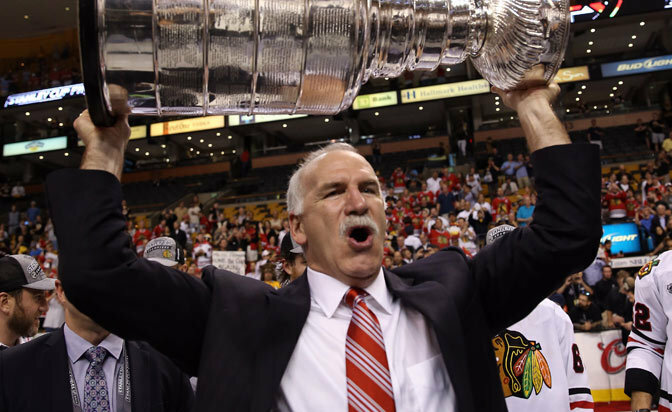 Quenneville was fired after the 2007-08 season and became a pro scout with the Blackhawks in September 2008. He replaced Denis Savard as coach on Oct. 16. Chicago reached the Western Conference Final in 2009 before winning the first of its two championships under Quenneville a year later. The New Jersey Devils had 102 points through 79 games in the 2006-07 season. They were on their way to their seventh championship in the former Atlantic Division. It wasn't enough for Julien to keep his job. He was fired with three games left. It was a stunner, and it could have ruined Julien, who had already been fired by the Montreal Canadiens halfway through the 2005-06 season, his third in La Belle Province. Julien landed on his feet a few months later when he was named the 27th coach in Bruins history. He took over a team that had the talent (Patrice Bergeron, Zdeno Chara, Marc Savard, Phil Kessel and Milan Lucic), but needed guidance. The Bruins made the playoffs in each of Julien's first three seasons, including in 2008-09, when they won 53 games and Julien won the Jack Adams Award. But they couldn't get past the Eastern Conference Semifinals, and even had that infamous meltdown against the Philadelphia Flyers in 2010, when they blew a 3-0 series lead and lost in seven games. However, the Bruins rebounded to win the Stanley Cup in 2011 behind Julien's leadership, Conn Smythe Trophy and Vezina Trophy winner Tim Thomas, and a balanced lineup that featured 12 players with 10 or more points in the playoffs. It was the Bruins' first championship since Bobby Orr led them to the Cup in 1972. The Bruins returned to the Cup Final last season, losing in six games to the Blackhawks. This season, they lead in the Presidents' Trophy race with three games to play. Babcock has been to the Stanley Cup Final three times since 2002-03. He won the Stanley Cup with Detroit in 2008. He has won two Olympic gold medals as Canada's coach (2010 and 2014), and gold at the IIHF World Championship in 2004 and at the 1997 World Junior Championship. He is the only coach in the IIHF's Triple Gold Club (Stanley Cup, Olympics, World Championship). However, Babcock is doing perhaps his best coaching job this season. The fact he has the Red Wings on the verge of clinching a playoff spot is remarkable considering the injuries they've had and the inexperienced players they have infused into their lineup. Everyone in Detroit knew this was going to be a transition year because many of the players who won the Calder Cup with the Grand Rapids Griffins were going to challenge for roster spots in Detroit. But nobody expected the Red Wings to have to make the playoffs on the backs of some of those players. That appears to be happening now. Forward Gustav Nyquist has been a revelation. Tomas Tatar, Riley Sheahan and Tomas Jurco have made up a formidable line. Defenseman Danny DeKeyser is having a breakout season. Luke Glendening has been rewarded for his play as a depth center with a three-year contract. Babcock has been the steadying influence. He hasn't changed his approach or the team's direction because star forwards Henrik Zetterberg and Pavel Datsyuk have had major injuries this season, or because forwards Johan Franzen, Darren Helm, Justin Abdelkader and Daniel Alfredsson, defenseman Jonathan Ericsson and goalie Jimmy Howard have missed chunks of time as well. Although he's proven so much, as Bylsma gets ready for his sixth straight appearance in the playoffs with the Penguins there is a bit of a show-me or prove-it feel around him and his team. 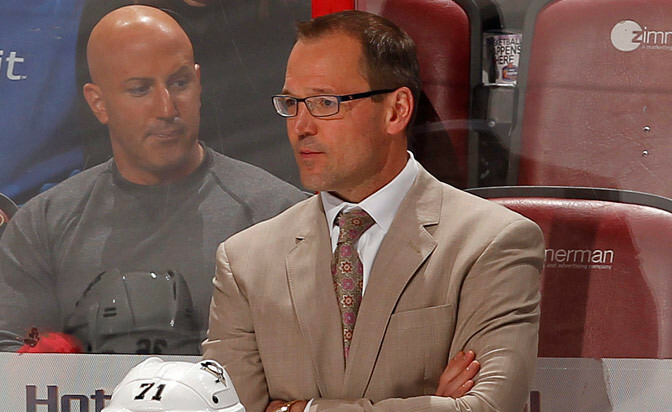 Bylsma won the Stanley Cup in 2009, less than four months after taking over for Michel Therrien behind the bench. He became the fastest coach in NHL history to reach 250 wins; he reached the milestone last week, in 396 games. However, after the Penguins were swept by Boston in the Eastern Conference Final last season, scoring two goals in the four games, the conversation turned to questions about Bylsma's job security and if time was running out on him in Pittsburgh. He has staved off those questions this season with another fine coaching job in spite of adversity because of injury. Pittsburgh has a League-high 506 man-games lost to injury, but it ran away with the Metropolitan Division and will finish with the second-most points in the Eastern Conference behind the Bruins. The Penguins didn't have goalie Tomas Vokoun all season. Forward Pascal Dupuis sustained a season-ending knee injury in December. Defenseman Kris Letang was lost for the season in late January because of a stroke. Center Evgeni Malkin hasn't played since March 23 because of a foot injury. Forwards James Neal, Beau Bennett and Tanner Glass, and defensemen Brooks Orpik, Paul Martin and Rob Scuderi all missed chunks of time as well. Orpik, Martin, Scuderi and Letang -- four of Pittsburgh's top six defensemen --- were out at the same time in mid-December. However, center Sidney Crosby has posted his fifth-career 100-point season and goalie Marc-Andre Fleury is two wins shy of his third 40-win season. Bylsma has mixed and matched his lineup, particularly his bottom-six group of forwards, for most of the season, and has found results. Hitchcock took the Dallas Stars to the Stanley Cup Final in back-to-back seasons (1999, 2000), winning the championship in 1999. He got the Philadelphia Flyers to the Eastern Conference Final in 2004, brought the Columbus Blue Jackets to the playoffs for the first time in franchise history in 2009, and has the Blues in the playoffs for a third straight season. This season, though, the Blues are thinking Stanley Cup or bust. Why else would they have traded for goaltender Ryan Miller? St. Louis turned into a contender the moment Hitchcock took over early in the 2011-12 season. The Blues went 43-15-11 in 69 games under Hitchcock and reached the second round of the playoffs before bowing out to the Los Angeles Kings in four games. They went backward last season, losing to the Kings in a six-game, first-round series after winning the first two games. The addition of Miller answered the Blues' questions in goal and primed them for a deep playoff run. Hitchcock has had all the answers since arriving in St. Louis, but he'll have to come up with more because the building is over in St. Louis; it's time for a championship.